Heading the weights for the £75,000 Listed Sky Bet Chase, staged at Doncaster on Saturday, January 28, are Mad Max, who could have his first start for Neil Mulholland, and the David Pipe-trained I’msingingtheblues, who have both allotted been 11st 12lb. Course and distance winner Calgary Bay, successful in a Grade Three handicap at Cheltenham on New Year’s Day, has been allotted 11st 11lb, while Noland and Aiteen Thirtythree, two of five entries for Paul Nicholls, are both set to carry 11st 10lb alongside Pipe’s Tamarinbleu. The ante-post favourite Hold On Julio, who is 5/1 with sponsor SkyBet , has won both his starts impressively since joining Alan King and received 11st 4lb. King could also be represented by Araldur (11st 3lb), who was last seen out when 10th in the BetVictor Gold Cup at Cheltenham in November. Fruity O’Rooney, who has been raised six pounds after his runaway success in a three-mile handicap chase at Kempton over Christmas, has been allotted 11st, and trainer Gary Moore is looking forward to running the progressive nine-year-old in the Sky Bet Chase. The Sussex-based handler said: “Fruity O’Rooney is very much likely to run in the Sky Bet Chase. He’s been in good order since Kempton, but he’s gone up 6lb, and any time they go up in the weights that’s got to be a concern. 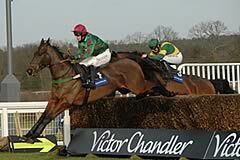 “He’s not the biggest horse in the race, but he carried a lot of weight at Kempton (11st 7lb) and managed to win. He should be around 10lb off the top horse this time, which will be perfect. Aerial (11st 9lb), who joined Paul Nicholls from France at the beginning of last year, could step up to three miles for the first time after a comfortable success at Ascot’s Christmas meeting. Nicholls could also run Royal Charm (11st 5lb), and the promising Michel Le Bon (11st 4lb), who returned from a two-year absence in the Hennessy Gold Cup last time, where he finished down the field. 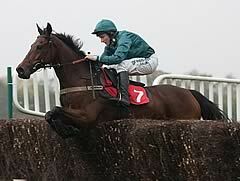 Nicholls sent out Big Fella Thanks to win the most recent renewal of the Sky Bet Chase in January, 2009. The past two renewals have been lost due to adverse weather. Shakalakaboomboom (11st 4lb), a winner at Cheltenham in December, is one of five entries for Nicky Henderson and the Seven Barrows handler has commented that the eight-year-old will swerve a visit to Haydock this weekend in favour of the Sky Bet Chase. The Lambourn trainer has also entered Forzy Origny (10st 13lb), the talented Aigle D’Or (10st 12lb), who was last seen finishing sixth in the Paddy Power Chase at Leopardstown over Christmas, Simon Munir’s Be There In Five (10st 10lb), and Osric (10st 1lb). Pipe, who won the 2008 Sky Bet Chase with An Accordion, could also run recent Wincanton scorer Consigliere (11st 5lb), and Matuhi (11st 2lb), both of whom would be attempting three miles for the first time in their careers. Malcolm Jefferson has entered Cape Tribulation (11st 4lb), a staying-on fifth to Calgary Bay at Cheltenham, King Fontaine (10st 1lb), who strung together a four-timer last season, and recent Rowland Meyrick Chase winner According To Pete (11st 2lb). Rowland Meyrick Chase runner-up Helpston (11st) is more likely to stick to novice company according to trainer Pam Sly, but fourth placed Wayward Prince (11st 6lb) could represent Ian Williams, as could Fredo (10st 6lb), who was second to Hey Big Spender in the Classic Chase at the weekend. 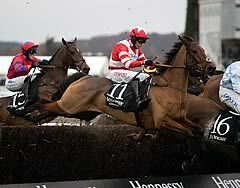 Wymott (11st 2lb) trained by Donald McCain and owned by Trevor Hemmings, is being targeted at the Grand National.